Bandra is not called the queen of Mumbai's suburbs for nothing. It is where some of Bollywood's biggest stars live. 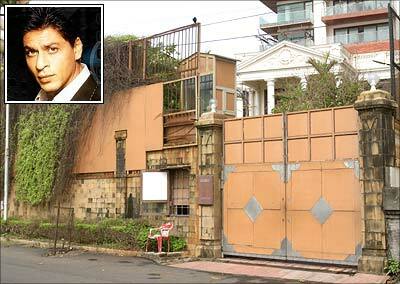 Shah Rukh Khan's home Mannat, which faces the Bandra seafront, is an obvious tourist spot. A sprawling bungalow, once owned by wealthy Parsis, Mannat is a heritage building. Buildings in this category are deemed important to the townscape and cannot be demolished. Shah Rukh lives here with wife Gauri, their two children and SRK's sister. The superstar is currently constructing a multi-storey building behind his home (seen behind Mannat in the photograph). Some reports suggest the building will house offices for SRK and close friends Karan Johar and Farah Khan.